Well I had planned to finish blogging August's fun and games today but it seems that autumn has arrived instead and boy did mother nature want us to sit up and take note. 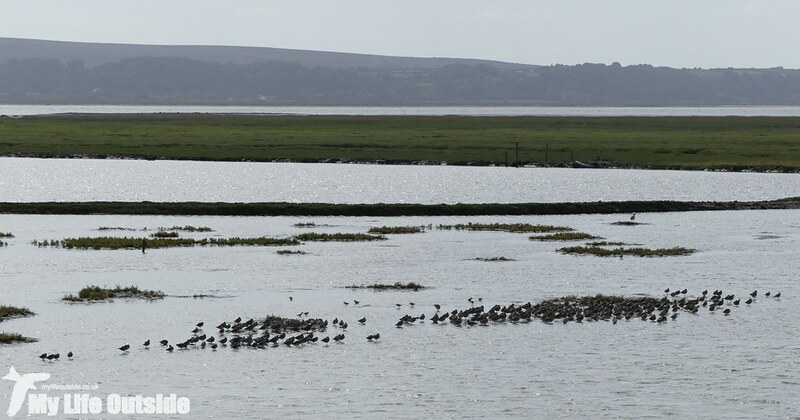 In terms of weather you'd be forgiven from thinking that it was still mid summer but down at Llanelli WWT this afternoon the birds begged to differ. Although there were still a few Swallows darting about plus the odd Willow Warbler here and there out on the saline lagoons was a flock of at least fifty Wigeon. These are my first returning birds and are a sure sign that things are in motion once more as we wave goodbye to our spring migrants and welcome back the waders and waterfowl which overwinter on the Burry. Talking of waders there was a sizeable gathering outside the British Steel Hide which included no less than 24 Greenshank, 60 Lapwing, at least 170 Black-tailed Godwits, 6 Dunlin and well over 200 Redshank. A sizeable haul for sure but there was much, much better to come. Picking through the birds carefully revealed first a lone Ruff, then 70 Knot before, best of all, a group of 6 Curlew Sandpipers wandered into view! Yes, six! I've spent the last couple of weeks searching for just one and have agonised over a couple of Dunlin here and there but when you see the real deal there can be no mistake. That long, drooping bill and pale white eye stripe are highly distinctive in the field and this little gathering represented not only my highest one day count for the species but also my best ever views. The various wader species even had the good grace to pose next to each other periodically allowing some excellent comparison views and notes to be taken. I was pretty made up to be honest but alas didn't quite have the reach to record this remarkable moment for posterity. Instead we'll have to make do with a somewhat chromatic overview of the entire scene which includes the Curlew Sandpipers back and centre. That little lot had already made this one of my most memorable trips to the reserve so when a juvenile Marsh Harrier glided into view it was both unexpected and unsurprising in equal measure. I presume this to be the same bird which has been recorded on both sides of the Burry in recent weeks but this was the first time I've managed to catch up with it and also the first individual I've recorded from Penclacwydd. With the sun breaking through we had almost perfect conditions in which to watch, the birds golden brown plumage shining beautifully and changing colour with each swoop and bend of wings. Given its unusual status here I was happy to help others in the hide get onto the Harrier, not as easy a feat as it may at first sound given the birds insistence on staying about as far away as possible whilst still remaining in view. My job wasn't helped any by a Buzzard also doing the rounds, the pair of them upsetting Lapwings and Curlew alike. They weren't the only raptors about either with a stunning Sparrowhawk perched up on a fence out on the marsh before darting off in pursuit. Further signs of autumn were to be found on the NRA scrapes where seven Pochard had dropped in, my largest count here for quite some time. Keeping them company was a Little Grebe and several Teal. Over at the Boardwalk Hide we found yet more Teal but also a trio of female Shoveller though we had to wait until the Millennium Wetlands to finally record our first Gadwall of the day. In all we saw forty eight species in just a couple of hours, a fine total for this time of year. I should also mention the number of butterflies and dragonflies on the wing which today included a Southern Hawker (seen above), tens if not hundreds of Common Darters as well as Comma, Red Admiral and Speckled Wood. 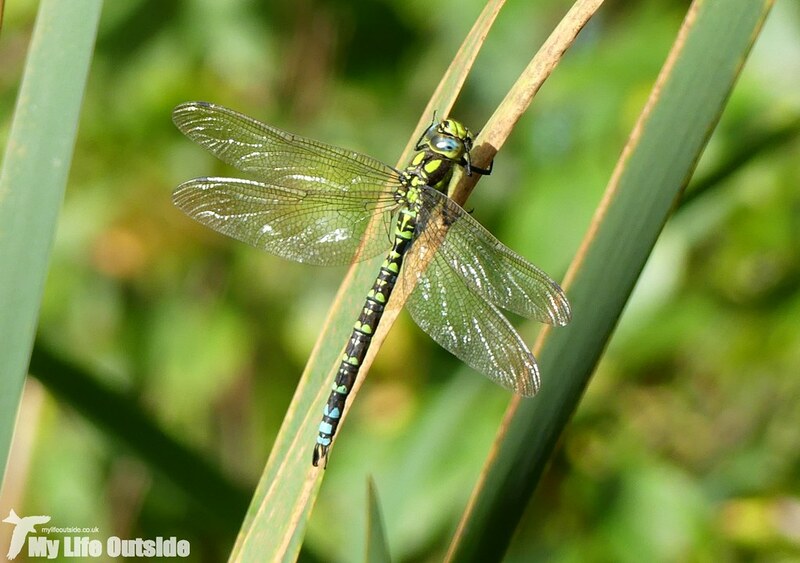 In terms of the dragonfly I'm also happy to report that my recent purchase of a new field guide (Britain's Dragonflies by Dave Smallshire and Andy Swash) proved its worth immediately, allowing me to confirm my identification within a matter of seconds. Now if only I'd picked it up before the dragonfly season was nearly over. Hindsight's a wonderful thing.